A little while back my wife and I took our son to Disney World for our family vacation. He loved it!! He had a 24/7 smile the whole time we were there. As a father, I couldn’t have asked for a better vacation. As a landscape photographer, I also wanted to explore Florida’s coastal landscape. Since we were driving, I thought it would be nice to stop on the way home and do a little work. After a few hours of keyword searching on Google, I came across a photo titled “Boneyard Beach”. How could I resist clicking on the link? 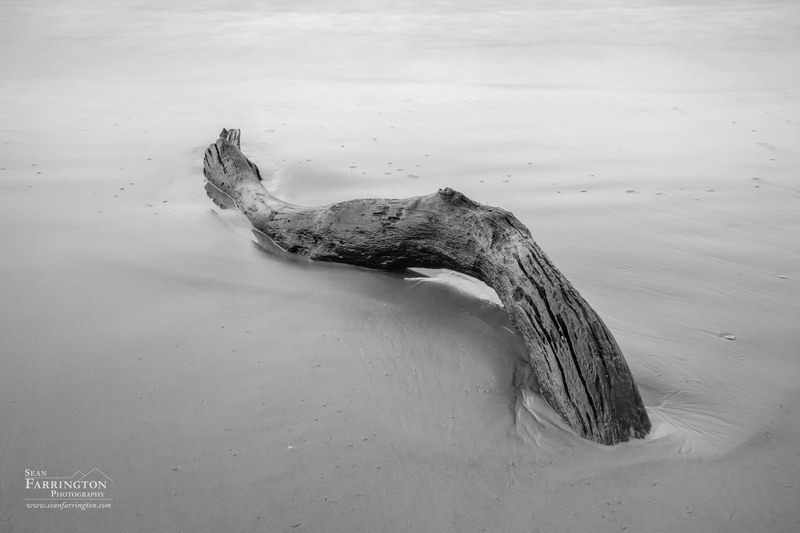 I was pleased to find some amazing images of a beach north of Jacksonville that was littered with dead wood. Since we were planning on stopping outside of Jacksonville for a night this worked out perfectly. Fallen trees along “Boneyard Beach” on Florida’s Atlantic coast. This was an incredible find! The beach is part of Big Talbot Island State Park just northeast of Jacksonville. There was such an amazing contrast between the deadwood and the sand and surf. The island is part of Florida’s barrier islands and this particular stretch of beach is constantly being eroded by the surf, causing the trees to break free and fall onto the beach. Stepping on the beach all you could see was deadwood from one end to the other. Having just a short time before the sunset and the time the park was set to close, I quickly got to work exploring the beach. I can say for certain that I was just like a kid in a candy store as I worked the scene looking for creative compositions. Dead wood from a fallen tree off the coast of Florida. 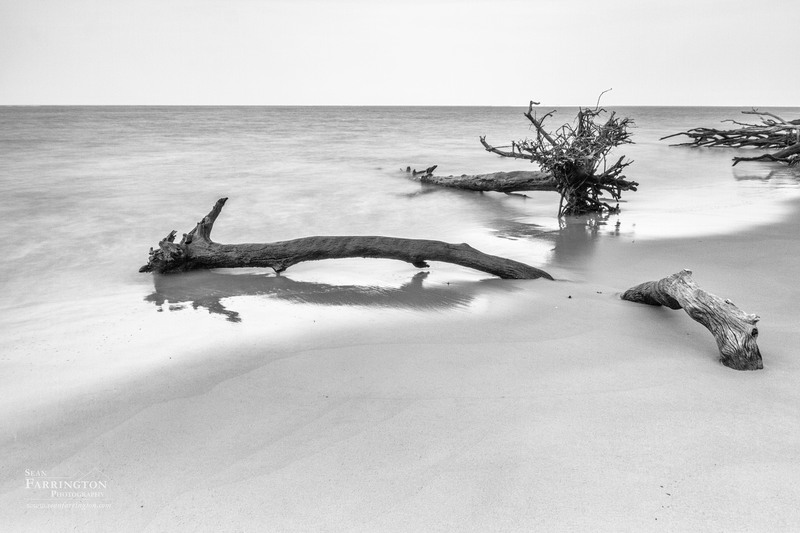 Posted on June 13, 2015 June 24, 2017 by Sean FarringtonPosted in Black & White, Fine Art Photography, Landscape photography, Seascape, UncategorizedTagged beach, Black & White Photography, Fine Art Photography, Florida, Landscape, Long Exposure, Monochrome, Photographer, Photography, sand, seascape, Summer, Trees, Water, waves. Sean is fortunate to live in central Vermont with his wife and their son. He has a strong love for the outdoors and enjoys any opportunity to get out and explore the back roads and backwoods of Vermont. Living in central Vermont gives him year-round inspiration for photography. Within a short drive of his home he has access to Vermont's beautiful Green Mountains and at the same time, some of the most photogenic farms and natural landscapes in New England. Photography is an all-consuming passion for him. His exposure to photography began at a very early age watching and helping his mother develop black and white images in her darkroom. His knowledge of photography is mostly self-taught. Sean has a B.A. in History; part of his love for photography comes from his fascination of history and trying to preserve the natural beauty of the world around him. His passion is landscape photography. The picturesque mountains, streams, and lakes of Vermont—along with the historic architecture and farms tucked in amongst the Vermont landscape provide wonderful subjects to photograph. Add in the changing seasons and he is presented with unlimited inspiration.